I wanted to quickly post this amazing deal from Sephora. 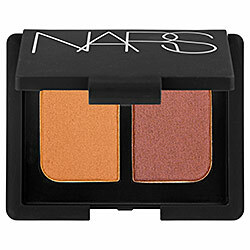 They are running a promo for $10 for a NARS eyeshadow duo which would normally run you about $32 plus tax. I would jump on this boat and pick both colors up! Thats only $20 for two shadows that would normally be $64. Let me know if you guys pick them up! I picked up both- couldn't let this deal pass me by! I saw it last night but ended up ordering the Boscia Peppermint Blotting Sheets for $5 and took advantage of the F&F sale for one last time. I picked up cheyenne right when I saw! And with the FF sale, it was only $8! What a steal. thats a great deal. shame we dont have a sephora here and they dont ship here as far as i no. hi--- where in nyc do you buy the seche veet nail polish you tweeted about? or do you have to order online? thanks, and as always, you're awesome! haha i was afraid they'd sell out quick so i made the order last night. i hope they're not crap though! If you have a chance, please check out my 'Dare to Wear' challenge for AIDS Charity. For everyone who recreates a look posted on my blog, my parents and I will donate money to The Stephen Lewis Foundation. Just came across your blog! Why Belle Du Jour? It means quite literally, Beauty Of The Day and this is my corner of the universe where I talk about all things beautiful, be it cosmetics, fashion, travel, jewelry and lifestyle. A twenty-something year old in the Fashion, Beauty and PR industry living, breathing and obsessing over all things beautiful in Manhattan, New York. Designed by Social Market Branding. www.SocialMarketBranding.com @SocialMBranding. Powered by Blogger.